I feel like I was shorted the first week of 2016, but things are getting back to normal around here and I plan to make up for lost time. 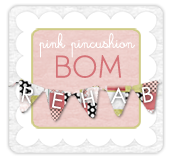 My first goal for 2016 is to blog about my 2016 goals, one down! So this was my number one goal for 2015. And it worked out so well I'm keeping it for this year too. Last year I found that doing more of what makes me happy sometimes meant saying "no". For 2016 I hope to continue to say no, only this year without feeling guilty about it. Baby steps. But just stopping to think about what makes you happy can create happiness, give it a try! 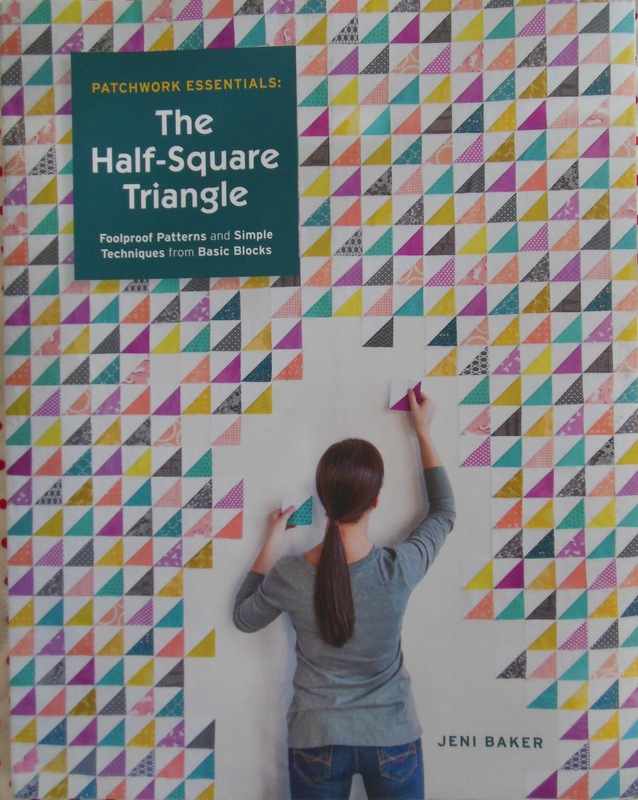 My first quilting goal for 2016 is to finish my Snapshots quilt. I've got a good start, the blocks are pieced and I've added the red sashing, which I love, it really adds a lot to each block! I hope to have this top finished this week. I have a few 2015 goals that I'm carrying forward to 2106. 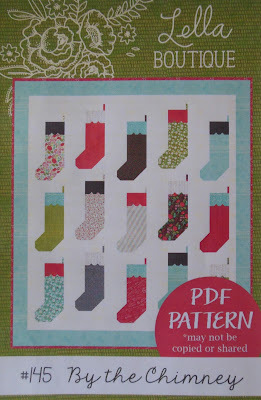 I'm still looking for the perfect fabric to make this pattern by Cindy Lammon. I have the perfect spot to hang it, I'm hoping this is the year I find the yardage I like to finish this project. That's the main problem, it needs yardage not fat quarters. Last year I also wanted to make a project using a Laundry Basket Quilts pattern. I have several, and love most all of Edyta's quilts. It didn't happen in 2015, but I did buy another pattern, Driftwood! Hopefully this is the year. Besides rolling over some 2015 goals, I'm rolling over four 2015 WIPs. Zipper using Little Black Dress 2. I love everything about this project. I stopped working on it when I was asked to sew some samples, I'll finish it this year for sure. 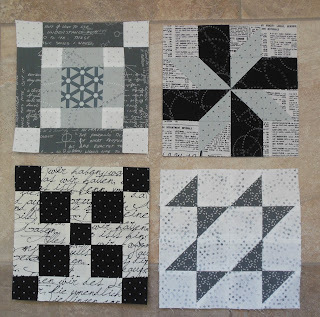 I started the Moda Sampler Block Shuffle. 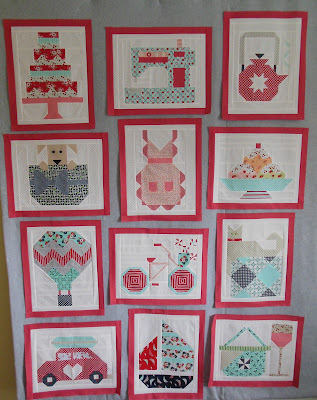 I like the patterns, the blocks, and my fabric choice. But I think each block needs a hint of color, so I'm going to rework these blocks by adding some very pale solids.....I think. I plan to play around with them for sure. My Plus project was interrupted by market sewing. I like the fabric and the pattern, I may add some background fabric and rework the colors for a less busy look. Another project I look forward to finishing this year. but it makes me happy to have a traveling/TV watching hand project to work on, so I'll keep plugging along. And if that's not enough, here are a few new goals for 2016. 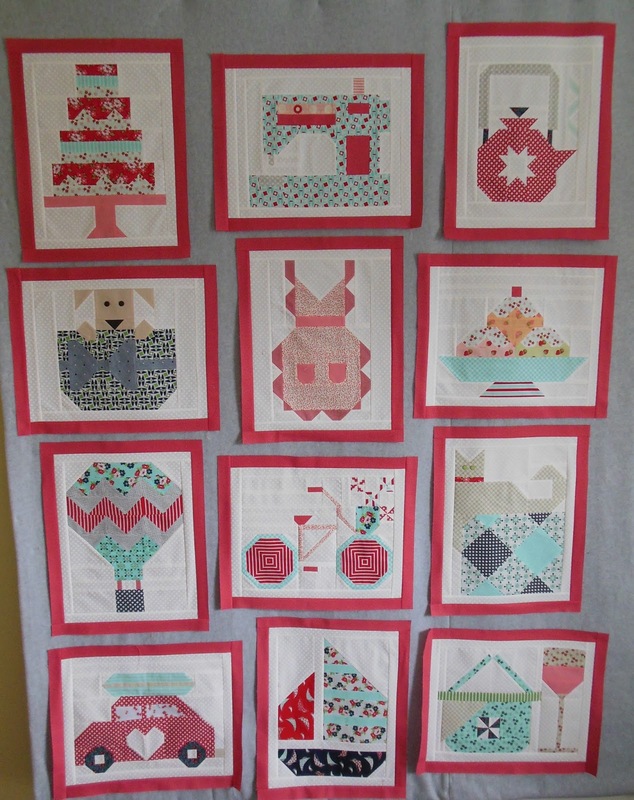 My goal this year to to finish at least 4 Christmas quilts, 6 would be better. 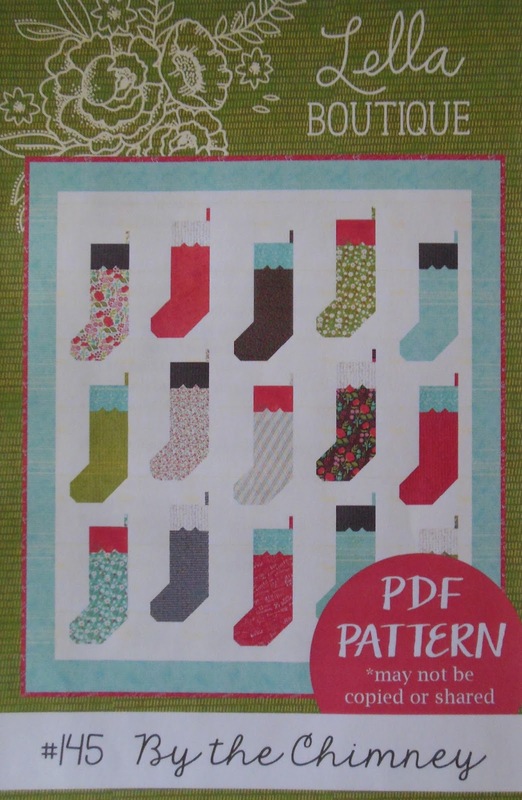 And this By the Chimney pattern by Lella Boutique is the first one I plan to make, just as soon as I get the 2015 Christmas decorations put up and give myself a two week Christmas break. I figure I can squeeze in a Christmas project every other month. 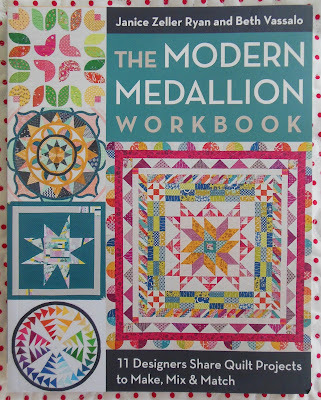 I LOVE medallion quilts, and this book has dozens of projects and even more combinations to create an amazing and custom quilt. Now I just need to decide on a plan of attack for the fabric. I hope to make at least one of them in 2016. 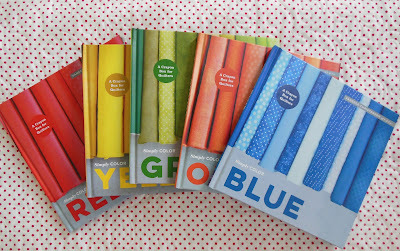 I love these color books by Vanessa Christensen, there's one book left to complete the set, Purple. 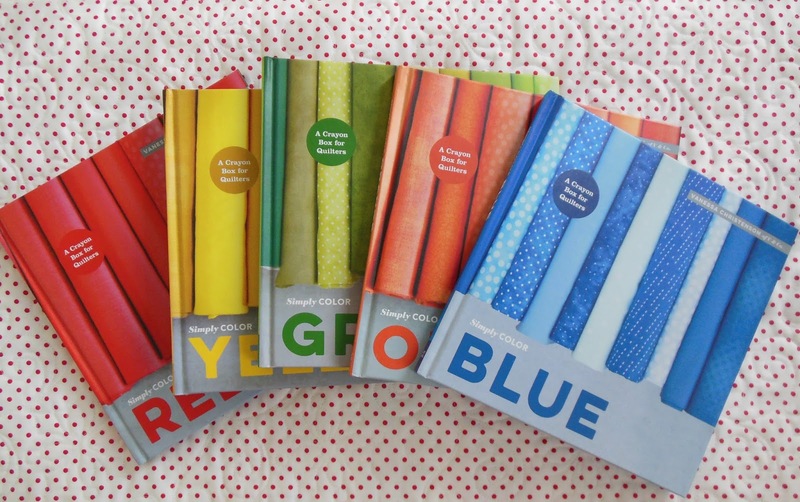 There are projects in each book that appeal to me, and I would even like to try to make a blue, green and purple quilt, even though I don't like blue, green or purple. Last year I finished what I thought was the first of many projects using Cotton and Steel fabrics. I only finished Cotton and Steel One, hopefully Cotton and Steel Two will make it to my Lifetime Quilt List this year. maybe 2016 is the year!! And if that's not enough, I would like to learn how to use EQ7. I draw my designs using paper and pencils, but being able to easily add and change colors to the designs I have flloating around in my head would maybe be fun. So that's my plan for 2016, more like my starting point, I'm always open to joining a good sew along or jumping on the latest new thing. What's one goal you have for 2016? Leave a comment with something you would like to work on this year and be eligible to win a $50 gift certificate to your favorite online shop, Amazon, Fat Quarter Shop, your choice, if they'll send it to you electronically it's yours. Giveaway ends midnight Thursday, January 14th. Please leave email address as contact. Like you, I am gravitating towards brighter colors and modern design. I would like to clear out the the dozen or so projects from my reproduction period by finishing them. Since the quilts vary in size, it should be a doable, though challenging, goal. I'd like to focus on being a finisher. Simply put....Stay with a project from start to finish, until the last stitch is put in the binding. NO MORE UFO's! I want to finish up all twelve of my current projects before starting anything new. Yah right, realistically I might get two done before starting something new. But I do plan on finishing all but two of these this year. Not sure if they will ever get done. That's a big list you have ma'am! Very inspiring!! I hope to make 6 minis this year. I have the patterns and fabric. Should be no problem, right? I've got a quilt to make as a wedding gift for my nephew and looking for the right modern pattern. Love your zipper quilt. Is there a pattern? I want to make a quilt using V. Christensen's Ombre fabrics. Got the pattern and the fabric hopefully soon. Way out of my league but I feel I need the challenge too. And...I feel anyone is lucky to get a quilt from Thelma of Coastal Lilly fame. Congrats on all your accomplishments. 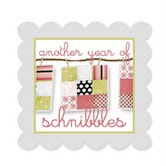 Funny coincidence, I just posted my quilting goals for the year too. Well, it's that time of year! First and foremost, I must finish my La Passacaglia EEP project, the top that is - the quilting can wait. My goal iS to finish a lot of flimsies- I love quilts, not tops. The actual quilting is not enjoyable to me. I am a piecer! Yay! I'm excited that you're going to do the star quilt. Mine is hanging in my dining room and still one of my favorites. I've got a list started for 2016 - trying to use up some of the stash. I've got some great projects planned though! Happy New Year! I,have a closet full of finished tops. I plan to finish at least six of those this year. Thelma, I really enjoy reading your posts. I would like as my goal this year to finish one personal quilting project a month. Since I have a longarm quilting business, that is an ambitious goal. Welcome back, my friend! Since I started quilting, I have been a "one project on the go" kind of girl...until I started a New York Beauty sew along and I decided I would make the blocks into a quilt for my oldest son, which meant a whole lot more blocks. I made 54 NYB blocks and said No More! They're not enough to make Aidan a quilt, so now I need to decide how to finish these dust covered blocks. That is my number one goal for the year. He wants his quilt so badly! A couple weeks ago, I did buy the Zen Chic fabric in grey, white and orange to make him the Labyrinth quilt. I hope to surprise him with 2 quilts since he has been so patient with me. We went to Minneapolis for Christmas and there was a woman staying at our hotel who looked a whole lot like you! Happy New Year, Thelma!! I really admire your work ethic - you accomplish so much. I wish I were like that. This year I'm hoping to complete several UFOs I have hanging around or have them leave the house to live with someone else. Then, I'd love to be able to start a project and work on it until it's complete. You are an inspiration Thelma......I truly believe we accomplish more when we set goals!!! This year will take me out of my comfort zone for a few projects! Cotton and Steel HST is number 1. Thanks for sharing... I will try my best to stay focused!!!! Goals..hmmm...getting out of the cast on my left arm is goal number 1...then to finish some unfinished projects and stretch my creative side to include trying things that seem too hard to do, but with patience will be amazing! Seems I have some pretty big goals. :) I can't wait to see what you accomplish this year! 2016 is going to be a bit different for me and I'm really excited about it. It's going to be all about me. (sounds a bit selfish, I know) In other words I'm finally putting myself first. I have a couple of lists but they are primarily to remind me. I want to spend more time with hand work; I want to finish as many UFOs as I can but they must still hold my interest; I want to start paring down the pile of flimsies (quilt them). I, too, want to make a handful of Christmas quilts. You've said it best, Thelma, 'do more of what makes me happy'. Wishing you a wonderful 2016!!! I love how organized you are! I would also like to make that quilt by Hyacinth Quilts, but can't locate the pattern. Is that an issue of McCall's you have? Can you tell me the month and year? I think I may be able to locate it in my "library". Yet one more reason I should aspire to be as organized as you are! Thanks for the giveaway opportunity! I happen to love blue and white quilts and my goal this year is to get three tops I have made--they just need to be quilted--buggy wheels, split stars, and sail boats. If I'm really on the ball, I may even get my Mrs. Billings top finished--that would be awesome! I love the beginnings of your zipper quilt--very cool!! I made a 2016 one a month UFO list. I would love to cross some of these off the list this year. They are all still projects I actually like! tHx for the chance to win. happy New Year Thelma! I've never been one to make resolutions, but goals. I hope to use up what I have in my stash. I've finished 3 quilts that were waiting patiently for their binding to be finished. Now to finish another binding and get a move on at using what I have set up in project boxes! Happy New Year! Laura V.
My goal this year is to get half my Christmas quilt projects done. At the moment I have 7 quilts ready to be quilted and 7 "kits" ready to be sewn. Of course other projects need to be finished too....I have the Simply Color books also and, like you, I've been waiting on more information on the Moda Houses. Hope you have a terrific day! I'd like to finally finish the blue and white snowball/nine patch quilt that I've been making for my mam since 2011 - I'm just over halfway through the machine quilting but then have lots of hand quilting to add, so I'm not certain I'll manage a finish! I want to make a quilt for my granddaughter out of extra yardage I saved from the dress I made my daughter for her first day of school. I have lots of things I would like to finish but my goal is to focus on one (or two - see already distracted! ), until completed. Think I am off to a good start by setting up a weekly sewing session at my house with three of my local quilting friends. Good food, good friends, good times. Your goals and projects are always inspiring! I have somehow fallen behind on quilting in 2015 and haven't sewn nearly as much as I wanted to. In 2016, I want to get back to more sewing time and more finishing up UFOs that are hanging around, especially getting more tops quilted and bound and done. I have four (!) sent out for longarm quilting now so that should give me a big head start! I would love to make a Christmas quilt. Can you believe I only have one?? I also have unfinished projects that I would love to finish. I love your golas for 2016 and hope you manage all you put on the list. My goals are to finish my two Farmer's Wife quilts (I've splited the big one into two smaller and more doable projects), my Snapshot quilts (still need to make the last three and the camera blocks), finish my Green Tea and Sweet Beans sampler, make each month Schnibbles and all Aurifil quilts or blocks, make the FQS Crossroads quilt, make at least one bag and join the Moda All-in-a-Row quilt-along (already have a plan). I'll let you know at the end of the year how it's going! What a great list of projects & UFO's to finish for 2016 !! Looking forward to watching your progress on these quilt in 2016 ! I am hoping to finally learn how to straight line quilt on my machine. It would be great to be able to quilt some smaller quilts at home rather than having to send them out. 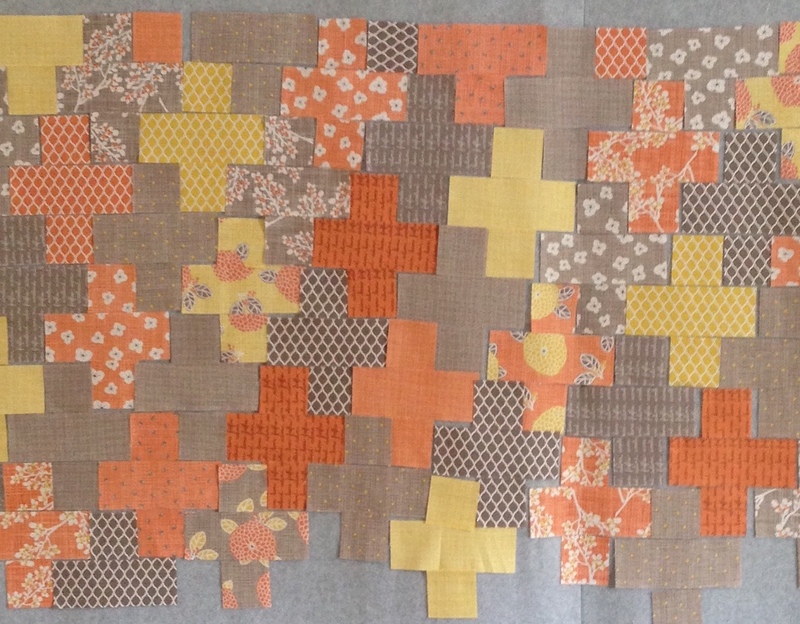 I am hoping keep up with the Glorious Hexagons quilt-a-long I recently committed to! Loved your goals! I too have my quilting goals--some I want to finish and some I just want to keep plugging away at. 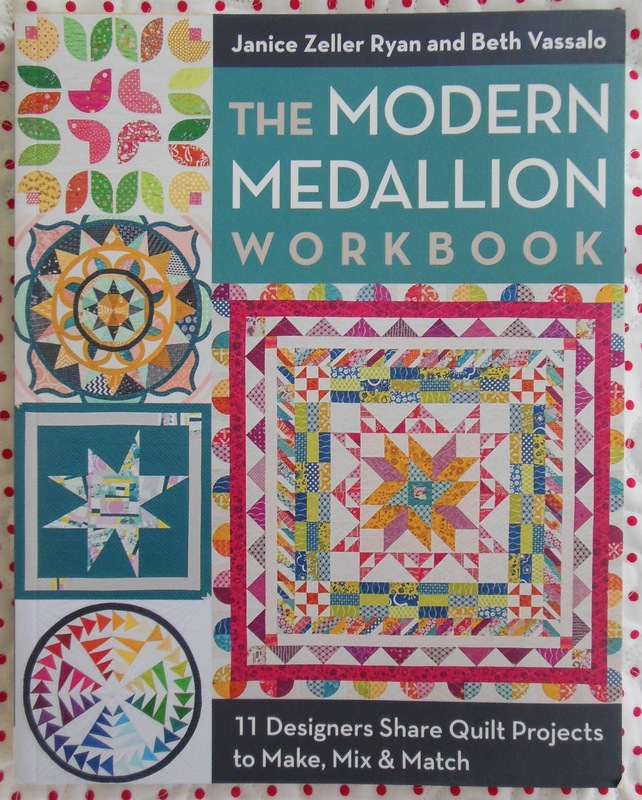 I do want to make a log cabin quilt (it has been a long time since I made one), moda shuffle quilt and I received the "row by Row" book for Christmas so that is in my list now too! Thanks for the great give-away! Love some of the projects you want to work on this year. I really need to finish more quilts, I tend to lose interest when it comes to making backings and I dislike hand sewing so bindings take forever to get done. I also have at least two dresser drawers of quilt kits I should get to, never a lack of projects to choose from! I like your plan for 2016! Saying NO is a very hard thing to do. Laundry Basket was on my 2015 list and I never got to it. I also have been admiring the By the Chimney quilts I saw over the holiday. Steam Punk is going to happen for me this year for sure! But an embroidery project is my challenge for 2016! 2016 promises to be full of fun. I turn 50 and, for some reason, I'm really looking forward to it. I started a new craft that I have been enjoying and I have been sewing baby cloths alot, but I'm hoping that I can get alot more of my quilting done between it all. I also really, really want to dust off my blog. I'm thinking I can start small on that one with a couple of posts a month. What else? Finishing! I want to finish more of the quilts I have. Either I send them out or work on my quilting skills. I'm very tempted to do the latter but my experience tells me I'll be excited until I actually START quilting. LOL! Anyway... I have TONS of things jumping around in my head, so I'm super excited for this year to rev up. Like you, I also have decided to make Christmas quilts this year. Hopefully I find the time. Love reading your list Thelma and so many good ideas that it makes me think twice about a couple of things. The two big things for me this coming year is a "Log Cabin " quilt...yes, I have never done one and this will be the year to do it! Not sure if traditional or modern but will start planning. The other big plan is after see the book just out on the exhibit in NY of the red and white quilts...I would love to do a two color quilt. I am thinking either blue and white or yellow and white. I do have a couple of patterns to choose from so will start there and plan a color choice then. So, there is the start of my 2016 and let the sewing begin!!!! I have way too many UFO's so my goal for 2016 is to finish them and try to whittle down my stash. I want to set aside more time to quilt. I have a lot of UFO's and things to work on, just need to make time for myself. Before reading your post today my goal was to make myself happy and do some selfish sewing for myslef and those I would like to gift quilts too. No more saying yes to co-workers and others who want commissioned work done and no more craft shows. I plan on making quilts for my husband and all three of my children...hope they like Christmas quilts because I have a huge stash of Christmas fabric. I have a soon to be Eagle Scout who will need a t-shirt quilt and I am participating in a monthly Bonnie and Camille block swap on IG. I am also making myself finish as many WIP's this month before moving on to any new projects. So far I have finished three tops! I always enjoy the variety in the projects you are working on....such eye candy as well! I took a wool applique class last year at a big quilt show (first time to take a class at a show!) so I'm working on several wool applique projects that I'll finish this year. I also love Edyta's quilts and hope to do one of her quilts.....now I need to decide which one.... I really like the goal of "doing more of what makes you happy".... I may have to adopt that if you don't mind! Using the just can't cut it fabric. I get it out and play with it and then end up using something else but if I make some mini quilts with the extra special fabric then I could see it everyday and still have some left over which I will still hoard and play with but it is a start. Being healthy and happy in 2016 is my No. 1 goal. Maybe that's two goals but I count it as one. I want to finish up a couple of UFOs that I love, and that will make me happy! Getting ready to have surgery in a couple of weeks which is impacting my goals for 2016, but with this I'll have more time for EPP and I've got a project or two that I would like to work on. Love your C & S project! My goal is to finish something--anything--but ideally two quilts for my new grand daughters on their first birthdays. I added notes to each month of my calendar about sewing/quilting that I want to accomplish that month. Hopefully this will keep me on track and more productive. I have two little grandsons who need a quilt made by grandma - especially the one who lives with us half of the time. I have so many quilts on my list for this year. I have a bunch of UFO's that need to come out and play. Thanks for sharing your plans for the year. Can't wait to see your finishes. Thanks for the giveaway! I would like to actually start quilting again, I've been collecting fabric, tools and vintage sewing machines (yard sales)for 25 years. I'd like to finally get around to using them. I've got most of the machines running well, enough fabric is cut for at least three quilts, there's 40 star blocks that I made way back then that need to be livened up with some brighter or prettier colors either as sashing or alternate blocks, because I really dislike them as they are. I really miss taking workshops because they kept me motivated, I'm out in the boonies now so that's not going to be happening soon. I have some Fig Tree mini patterns that I really want/need to make this year!! They are calling my name. Loved reviewing your year and seeing what is maybe on the agenda for this year. My first project for this year is a quilt for my granddaughter's bedroom. She chose the pattern Rudeneja, which was on the cover of the September/October issue of Quiltmaker magazine. It will be done in purple, turquoise, and lime green. I have all the fabrics and will start on it as soon as I finish upholstering two chairs for my daughter's office. That should happen today. 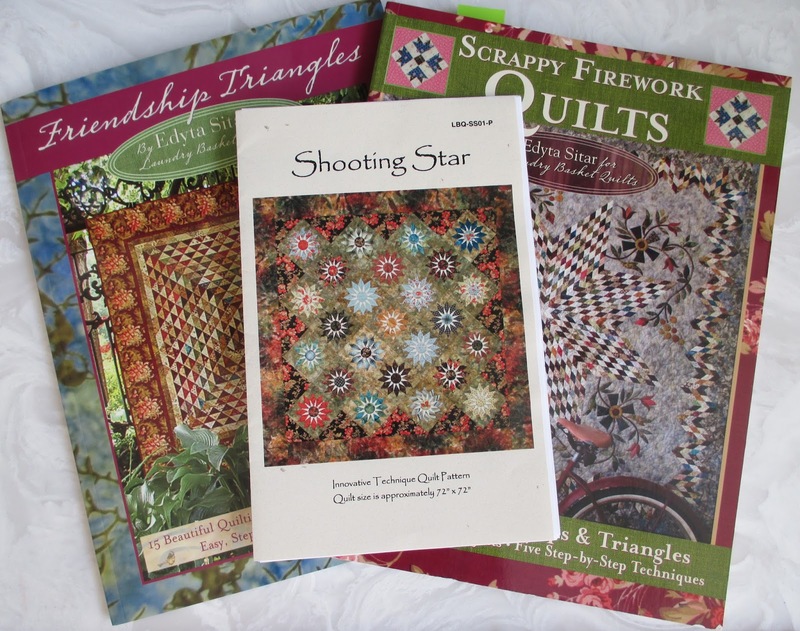 I am looking forward to getting back to quilting. My goal is to finish hand quilting a sweet water fabric queen size quilt that I have been working on for 4 years! Definitely finishing it this year! Was suppose to be a wedding quiet for my daughter, maybe 5 year wedding anniversary gift now! Your post is full of inspiration! I am definitely looking daily for inspiration and doing things that make me happy. My phone has an inspiration photo for each day but sometimes it's more than one:) I plan on finishing lots of quilts for everyone in my wonderful family and for my best girlfriend who is there for me always! Wow! That's quite a list! I'd really like to make some Christmas table runners for my college friends' birthdays in the fall (we're in our 50s and are still close!). I'd like to start on them in February so when their three birthdays roll around in October and November I'll be pleasantly surprised to have them finished! Wow, you always inspire me to get my behind going. For starters, I'd like to finish two projects that I recently found hidden away in my closet that involve appliqué. Both have an appliqué pattern in the middle, like a medallion. I was gung-ho when I started them 3 years ago, but then lost interest, or better said lacked ability. I'm wanting to give them a go again. Other than that, just plug along and do some productive sewing. Thanks for the giveaway and Happy New Year! Wow, that's a big list! But you always seem to complete an amazing amount of projects each year. A goal for me this year is to finish a bed sized quilt for each of our guestrooms (2. I have the patterns and fabrics just waiting. My goal for this year is to finish some of the UFO's I have stashed everywhere. The problem is that I keep getting distracted by all of the beautiful NEW fabrics and quilt patterns. Thanks so much for the generous giveaway! My main goal is to not try to do too much! There are so many projects I want to make and so many wonderful fabrics to use! I tend to start way to many and then I can't finish them. I still have children at home so I need to pace my projects a little better. I'd love to finish up some WIPs so I'm not letting myself start anything new until I finish up something I've already begun. I really want to work on my free motion quilting. I would love to be able to have someone, one on one , work with me. I want to work on my free motion quilting. I also want to sew dresses and more quilts this year! Thanks for the chance to win!! My goal is to make more quilts on my bucket list. I participate in so many challenges, swaps and exchanges that I don't have time to make quilts I want to make just because. 2016 is my year to do so. You had a very productive 2015 and it looks like you will be very busy in 2016 as well! I am determined to make Home for the Holidays, by Primitive Gatherings. To help keep me motivated, I'm sewing along with a group on Instagram. All of the wool blocks are prepped and it's time to stitch! Happy New Year! Up Next . . . .